A key indicator of consumer spending, retail sales, rose more than analysts expected in July on top of upward revisions to June and May. The Commerce Department said 10 of 13 categories increased sales in July, with electronics stores, gas stations and clothing stores declining – in part because of lower prices. Compared to July 2016, total sales were up 4.2% with only electronics stores and sporting goods lower. Consumer spending drives about 70% of U.S. economic activity. In a separate report, the Commerce Department said business inventories rose more than sales in June, which raised the inventories-to-sales ratio for the first time in 2017. Although the boost in inventories suggests greater confidence by businesses, the ratio indicates supply may be getting ahead of demand. The ratio is about where it was late in the recession. The choppy recovery in U.S. housing took a step back in July with housing starts dipping 4.8% from their pace in March and declining 5.6% from July 2016. 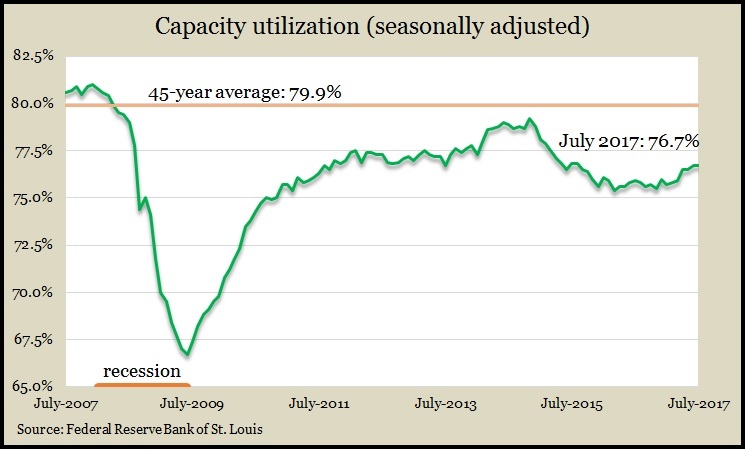 New construction remained above pre-recession levels but at less than half of the peak activity in 2006. Single-family houses, which make up about 70% of new residences, outpaced multi-family units, according to the Commerce Department report. Building permits suggested further construction, although their pace dropped off as well. Housing economists have cited a lack of new houses as a drag on real estate sales. The moving four-week average for initial unemployment claims fell for the third week in a row and the fourth time in five weeks. The Labor Department indicator is 32% below the historical average, which suggests employers continue to be reluctant to let workers go. That helps support a job market that should boost hiring and wages, which could fuel more consumer spending. The Federal Reserve reported that industrial production rose 0.2% in July, half the rate in June and less than analysts expected. Manufacturing output registered its third decline in five months, led by the making of automobiles and business equipment. Overall, manufacturing has been little changed since February after several months of growth. With production increasing for mining industries and utilities, the capacity utilization rate was unchanged at 76.7%, still far enough from the 45-year average of 79.9% to suggest that inflation is not an imminent concern. The Conference Board reported that its index of leading economic indicators rose 0.3% in July, half the rate in June. The gain suggests continued moderate economic growth, the business research group said. Consumer sentiment, financial indicators and new orders combined to offset the decline in housing permits among index components. A preliminary August reading of consumer sentiment showed rising expectations and a drop from a 10-year peak in assessments of current conditions. The University of Michigan, which conducts the longstanding survey, said sentiment levels suggest a moderate 2.4% increase in consumer spending in 2017.